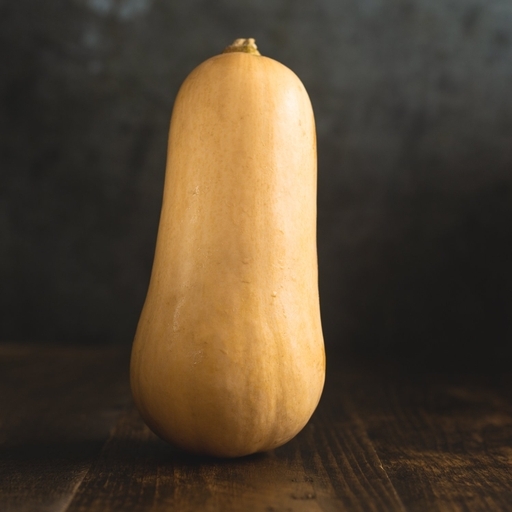 Curvaceous butternut, the most popular variety of squash, with a clean, creamy taste. It’s easy to tackle in the kitchen: thin-skinned and pretty quick to prepare – a good veg peeler will do the trick. Squash doubles up as a decoration as you store it, looking full of promise on a kitchen shelf. Roasting squash gives a dish of glorious colours and deep, sweet flavours. Good as a starter, drizzled with yogurt and chilli oil; as a side, mashed with nutmeg, salt and butter; or stirred into risotto just before the rice is cooked. Alternatively, squash is an excellent candidate for being stuffed and baked whole, or simmered in hearty stews, curries and soups. Keep squash warm and dry. Enjoy their decorative qualities by storing them on a kitchen shelf. They should last several months. Once cut, keep them in the fridge and use within a week. The UK season begins in October and runs until December for stored squash. Our homegrown butternut squash comes from Foskett Farms in Suffolk. We also grow some on our farm in France, for harvesting between December and February. They grow well there thanks to the favourable light levels in the Vendée region.